Here I am going to enlist the latest job offer from Capital Hospital Islamabad Jobs 2016 Online Form Download cda.gov.pk. Applications are being offered from the Capital Hospital Islamabad which in under the Capital Development Authority is the well known hospital which invites the well disciplined, and energetic applicants for training and career opportunities to basically medical educational holders are eligible to apply. So guys, today the vacancies are being offered from the Capital Hospital Islamabad which intends to employee the experienced as well as fresh applicants are required to apply for the following posts which includes Doctors (who have passed the FCPS Part-01), for Paid Postgraduate Training (FCPS Part-02) w.e.f and Fresh Medical Graduates for Residential structures House Job w.e.f is the post which is waiting for the applicants to come forward and fill them. Attractive pay package will be paid with growth offer on account of the best conduct of the applicants. Now, I will throw light on its eligibility and applying conditions below. Eligibility criteria for this training is required for the for Post Graduate Training (FCPS Part-02) in the following Specialties disciplines is required (Medicine, Paediatrics, General Surgery, ENT & Urology with documentation proof of General Surgery (Urology) of two years training is required. Specialities for House Job Training is needed in the following subject as (Cardiology, Medicine, General Surgery, Orthopaedics, Gynae & Obstetrics, ENT, Dermatology, Urology, Paediatric, Radiology and Ophthalmology is required. 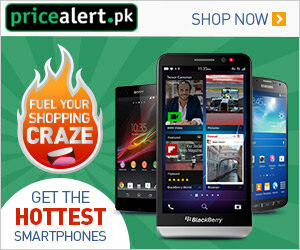 Applicants who meet the said criteria are required to send the application by downloading it from the CDA site as www.cda.gov.pk. Application form for the Post Graduate Training can obtained be from the Admin Section of this hospital from 13th December 2016 till 22nd December 2016. Last date for submission of Postgraduate form is 24th December 2016. Interview of the Post Graduate Trainees will be conducted on 29th December 2016 at 9:00am. For House Job Training the application forms will be obtained from the Admin Section of this hospital which is available from 2nd January 2017 till 14th January 2017. Last date for submission of House Job Training Application is 17th January 2017. On 27th January 2017 the merit list of House Job Trainees will be dispatched. Interview for House Job Trainees will be held on 28th January 2017 9:00am. 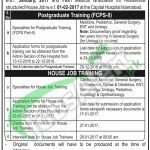 Last Date For House Job Trainees: 17th January 2017. Address: Executive Director, Capital Hospital Islamabad.